Menno Simons (sometimes spelled as 'Simonsz', 'Symons', 'Simmons' or 'Simonis') is without doubt the greatest figure in the history of the Mennonite Church. He was not the founder but is often called the regenerator of the Anabaptist movement. He certainly was its most important leader in the Netherlands during the sixteenth century. Menno assumed leadership during a crucial period in which the Anabaptist movement was in danger of losing its original identity. His prolific writings and moderate leadership were essential in unifying the nonviolent wing of the Dutch Anabaptists and maintaining their peaceful beliefs. Menno took his motto from I Corinthians 3:11 - For no one can lay any foundation other than the one already laid, which is Jesus Christ (New International Version). This motto, which he repeated in most of his works, points to the Christ-centeredness of his theology. 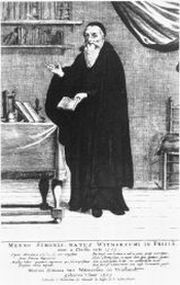 Menno's followers became known as Mennonites, a name that was later adopted by the Swiss Anabaptists who emigrated to America. Today there are almost 1.5 million Mennonites in 75 countries (source: Thirdway.com).